Be the first to share your favorite memory, photo or story of Mrs. Helen Sue. This memorial page is dedicated for family, friends and future generations to celebrate the life of their loved one. 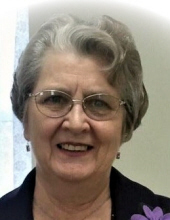 Mrs. Helen Sue Bond, age 80, of Dallas, Georgia, passed away on Saturday, April 6, 2019 at her residence. Mrs. Bond was born on November 24, 1938 in Spencer, Tennessee to William Joe Dennie Mills and Lena (Keyt) Mills. Prior to her passing, she was a homemaker. She was preceded in death by her husband, Rev. James Edward Bond; her parents, William Joe Dennie Mills and Lena (Keyt) Mills and her brother and sisters. Helen is survived by her son, Mike (Janeen) Bond; her son, Darrell Bond; her daughter, Jamie (Danny) Gastley; her grandchildren, Rebecca Bond, Michael (Kylie) Bond, Jr., Adam Bond, Nathan Bond, Alisha (Adam) Ramsey, Brittney (Anthony) Millsap, Spencer (Heather) Reynolds and Jared (Krista) Reynolds; her great grandchildren, Keller Bond, Finley Bond, Sarah Ramsey, Kaelli Ramsey, Kamden Millsap, Emmett Millsap, Haley Reynolds and Brantley Reynolds; nieces and nephews also survive. Funeral Services for Mrs. Bond will be held on Tuesday, April 9, 2019 2:00PM CST at McMinnville Funeral Home with Rev. Donald Owens officiating. Interment will follow at Spencer Town Cemetery (Spencer, Tennessee). The family will be receiving friends on Sunday, April 7, 2019 from 5:00PM - 8:00PM at Pickett's Mill Baptist Church. The family will also be receiving friends on Tuesday, April 9, 2019 at McMinnville Funeral Home from 1:00PM -2:00PM CST prior to the service. In lieu of flowers, the family wishes for donations to be made to the Pickett's Mill Baptist Church Children's Ministry. To send flowers or a remembrance gift to the family of Mrs. Helen Sue Bond, please visit our Tribute Store. "Email Address" would like to share the life celebration of Mrs. Helen Sue Bond. Click on the "link" to go to share a favorite memory or leave a condolence message for the family.